Located on Highway 89 and situated between Yellowstone and Glacier national parks, this small town is known for its friendly ranching community and natural hot springs. The area also has year-round recreation, with skiing, snowmobiling, hiking and biking nearby. It's also home to an annual music festival—Red Ants Pants. 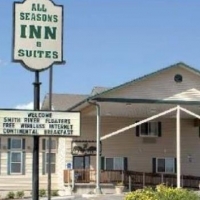 Rest your head at All Season Inn & Suites and enjoy a cozy night in small town Montana.